Harsk is a gruff and driven dwarf, following a vow of justice to avenge his brother's death at the hands of giants. He prefers tea to ale, wanting to keep his senses sharp. During Combat Harsk prefers fighting with his crossbow over his battleaxe but isn't afraid to get dirty in melee if the situation calls for it. His hatred for giants often motivates him to target creatures of that subtype to the exclusion of others, and to choose one as his quarry. If tracking a giant, he casts resist energy against an energy type that giant uses before engaging. Speed 30 ft., burrow 10 ft., climb 10 ft. Note: The badger's stat block does not include the adjustments from its rage ability. Harsk is an uncommon dwarf. He enjoys the wide skies of the open plains more than claustrophobic tunnels, prefers the taste of tea to alcohol, and handles his battles at range rather than in melee. As a young dwarf, he eschewed the company of his fellows, finding that few things made him happier than crouching in a tree stand with his bow, listening to the wind through the forest leaves and waiting for prey to wander by. That all changed twenty years ago when his elder brother, a captain named Sigur, led a dwarven war band from Janderhoff against a small party of raiding giants. Out of affection, Sigur offered his less-experienced sibling the chance to come and prove himself as chief scout and second-in-command. Calm and peaceful by nature, Harsk turned him down, failing to see the honor his brother was doing him until several days after the company had departed. Traveling light and fast, Harsk caught up with his brother quickly—but not quickly enough. Misjudging the size and skill of the raiding party, Sigur had led his band into an ambush, where it was slaughtered to the last dwarf. With his brother's blood still fresh on his hands, Harsk went mad with rage. That night, he stalked through the giants' camp like a vengeful wraith, slaughtering giant after giant with his crossbow before melting back into the forest, only to reappear elsewhere and take another victim. When the last giant was left gurgling in the dust, Harsk took up his brother's axe and slipped off into the trees, vowing to forever be the voice of justice in the wild places, to keep balance and prevent the sacrifices of noble warriors like his brother. 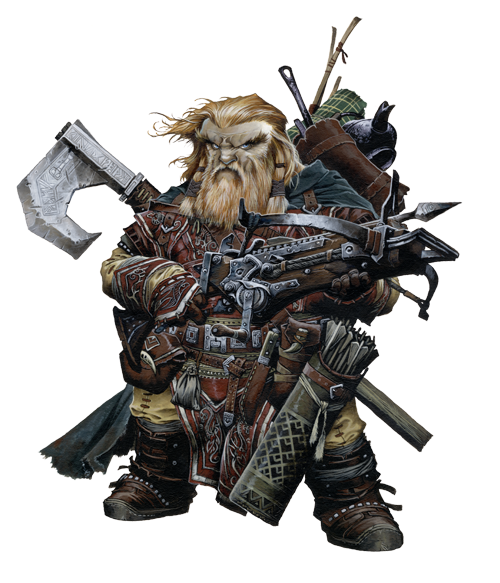 Harsk, like many of his kind, is gruff and taciturn, but there ends most of his connection to dwarven society. Something of a loner, he prefers to spend his time outdoors, communing with nature, though he occasionally travels alongside others whose goals match his own. Uninterested in the beer and ale so strongly associated with dwarves in the minds of human society, Harsk instead drinks pot after pot of strong tea to keep his senses sharp. While he never lets his brother's axe out of his sight, he wields it only as a last resort, knowing his true skills lie in the hunt and striking from darkness.